Herbie Hancock is a true icon of modern music. Throughout his explorations, he has transcended limitations and genres while maintaining his unmistakable voice. With an illustrious career spanning five decades, he continues to amaze audiences across the globe. Born in Chicago in 1940, Mr. Hancock was a child piano prodigy who performed a Mozart piano concerto with the Chicago Symphony Orchestra at age 11. He began playing jazz in high school and double-majored in music and electrical engineering at Grinnell College. 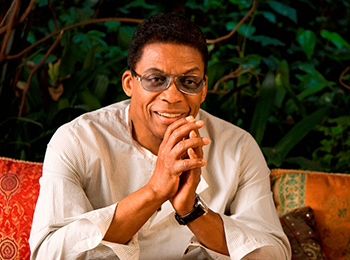 Mr. Hancock’s storied career has won an Academy Award, 14 GRAMMY® Awards, including Album of the Year for River: The Joni Letters and dozens of other accolades. He has released 53 records since 1962 and performed with artists as diverse as Snoop Dogg and Miles Davis. Now in the fifth decade of his professional life, Mr. Hancock remains where he has always been: in the forefront of world culture, technology, business and music. Though one can’t track exactly where he will go next, he is sure to leave his inimitable imprint wherever he lands. As part of Turnaround Arts, Mr. Hancock has adopted Sierra Preparatory Academy in Santa Ana, CA.